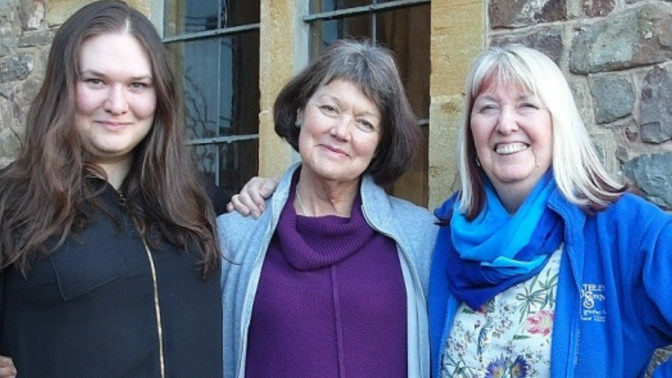 Maddy, Christina and Rose-Ellen will be leading their second vocal development course together at Halsway Manor and this performance is part of this celebration of voice. The evening will include content from the course participants, spoken word from Christina Shewell, and song performances from Maddy Prior MBE and her daughter Rose-Ellen, also a professional singer. It is not a fully ‘Maddy Prior and Friends’ show, but rather an opportunity to enjoy a relaxed, informal and varied evening of song and spoken word. Christina Shewell is a very experienced speech and language therapist, highly specialised in voice (issues involving the larynx for speech), and is also a qualified voice teacher, with a long experience in both training, and mending the voices of singers, actors and other public speakers. As an academic, Christina has been a staff member of both the Guildhall School of Music and Drama, and University College London, and is fascinated by the meeting point of art and science in voice. Her book, ‘Voice Work: Art and Science in Changing Voices’ (2009) is extensively used by singing teachers, spoken voice coaches and those working with voice problems. Teaching all around the world she cover many aspects of voice, including a simple way of analysing what we hear in a voice, to better understand and care for it, and more recently, the links between neuroscience, voice, psyche and everyday well-being. She has a Masters degree in linguistics, and has been honoured by a Fellowship of the Royal College of Speech and Language Therapists, and an honorary senior lectureship at University College London. Rose-Ellen Kemp began touring alongside her parents as a child. She started performing as a solo artist at age 15 and continued touring Europe and the UK for the next 10 years playing many prestigious shows, festivals and TV and radio sessions. Rose-Ellen signed to Bjork’s record label One Little Indian Records for a time and released an E.P. and three critically acclaimed albums. Her music encompasses many genres including; progressive rock, classic rock, choral, drone-metal, doom-metal, stoner rock and sludge, all with a solid grounding in the melody of the English folk tradition. Rose-Ellen is known for her uncompromising writing style and extremely far-reaching vocal ability. She is able to demonstrate large variation of tone, intensity and texture. Rose-Ellen has been a vocal tutor teaching mainly vocal technique at Stones Barn since 2003. This led her to spend four years training as a speech and language therapist at Newcastle University. This was in order to gain knowledge in remediating voice and communication pathologies as well as helping people to establish greater self-esteem through enhanced self-expression.